Happy weekend, everybody! Hope the weekend ahead is filled with relaxation & fun! We just returned from our trip to Puerto Vallarta, Mexico, and boy, what a trip! We headed down to normally sunny Puerto Vallarta for a friend's wedding, and were met with an oncoming hurricane! The wedding was fun and beautiful, however dampened by some tropical rain. The day after madness ensued with the resort putting all guests on a curfew due to a hurricane watch, with varying reports it was between a Category 4 & 1-needless to say we were kinda freaked out! But, we were with friends, and truly made the most of our time. Luckily the eye of the storm did not hit Puerto Vallarta, and was down graded to a Tropical Storm. Our flight was still cancelled, we had to pay for an extra night, but we got to stay an extra day with friends, and continued celebrating a marriage, and a little romantic vacation for the two of us. After we returned, the first thing I did was check my email, and I was thrilled to see this engagement shoot submission you're about to see, photographed by Brittanee Taylor Photography!! 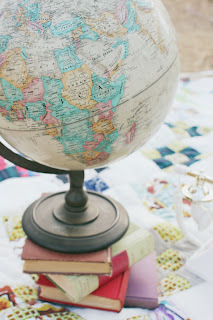 It's a vibrant shoot full of vintage style, a beautiful couple, and I am loving every detail! Enjoy! I do love Becca's vintage style! From her hair, to her dress, and the classic makeup, she's stunning! 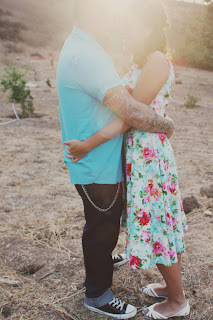 For this awesome engagement session Becca knew that she wanted it to have a vintage theme since the first day we met. I have met with brides before who wanted to do this so I was so excited. 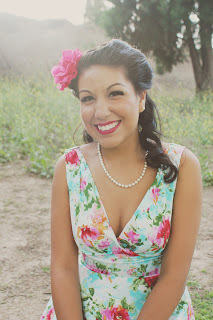 When I showed up for the photoshoot, she was fully decked out in vintage clothes! It was AWESOME! 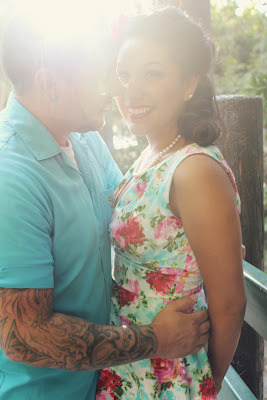 Her dress was from a vintage boutique in Downtown Covina, Ca. 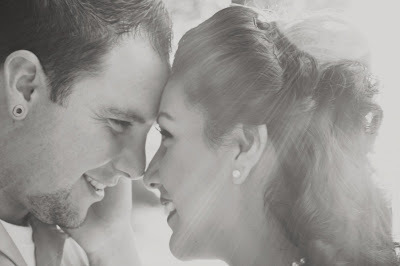 If her e-session was this cute, I know that her wedding will be amazing! 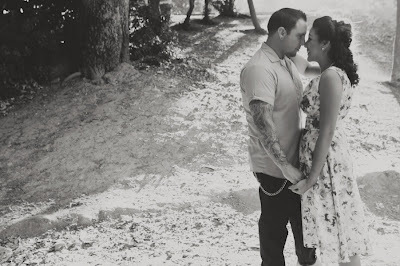 I agree that Becca & Kilani's wedding will be amazing! Many thanks to Brittanee for submitting to us this adorable e-shoot, and congrats to Becca & Kilani on their upcoming marriage! It is delish, isn't?! Thanks for the comment, lovely!